East Midwood Center offers a children’s Hebrew school in the heart of Brooklyn, combining language education with an education in Jewish tradition that guides students to think about the intersection of Judaism and Little Learners ages 5-9 meet Sundays from 9:30 to 11:15 a.m. in Room J, EMJC’s youth education center. Older children, preparing for bar and bat mitzvot, meet from 9:30-12:30 Sundays and from 3:30 to 6 on Wednesdays. We emphasize Jewish community, knowledge, and commitment. Small-group learning is hands-on; we believe understanding best comes through doing, and by translating words into action. Room J students of all ages draw, build, cook, compose, sing, act, sew, paint, dance, debate, interpret, and imagine. They sometimes make a big mess—and that’s great! Join us! For more information about our youth and family education classes, email Education Director Audrey Korelstein at roomj@emjc.org. 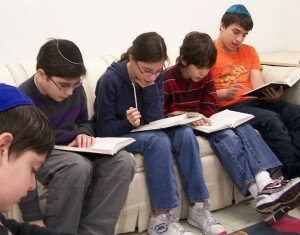 EMJC also offers ulpan Hebrew-language classes for adults. For more information email info@emjc.org.